If you're contemplating going with ANY (yes any) ISP that provides services via this Fibre ISP, known as Octotel, please be aware that you will be in for a world of pain. * The network in Cape Town is congested, and Joe Botha, the CTO, gives not one **** about it. Their offical response to sorting the problem out is a real mature and professional "any day now"
I am creating this thread because the Octotel issues are tending to cloud the CISP Feedback thread and I want folks to make an informed decision before getting FTTH at home. I’m with MWEB via Octotel. No complaints. We use Vox on Octotel at work (Cape Town CBD) and have no issues what-so-ever. Also with Octotel / Vox in CBD.No complaints. Octotel isn't an ISP fruityloop. It is funny though how all the other posts are how others have no issue at all on Octotel. Alrighty so then this problem is imaginary, even though the ISP has admitted it exists after I made enough noise. Just because YOU have a problem, does not mean the entire service is bad. The universe does not revolve around you..
Actually there are quite a few people with issues on the network. Paul from Cool Ideas mentioned that not only CISP but other Service providers have received complaints about Octotel as well. Some of us see your point @Arty, others might not know the full history. And I can guarantee you Octotel isn't the worst. Maybe RSAWeb is the issue? There is a known problem on portions of Octotel's network... It's not anyone's imagination and it's not the ISP. I agree Sinbad but its a bit late for that. 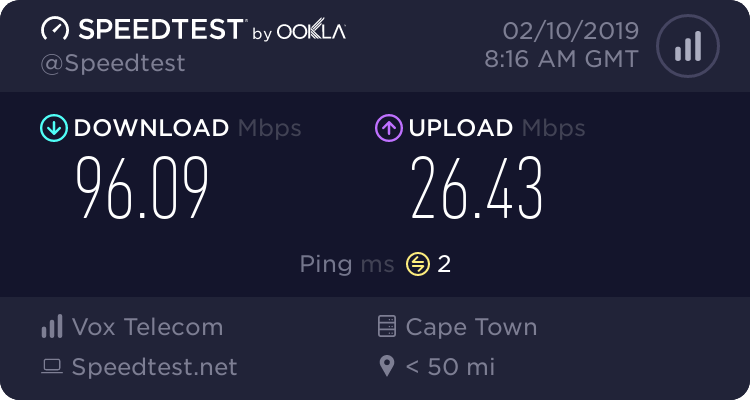 Already some people chose sides and made me out to be the bad guy because I was persistent and I knew from the start when I did that first test at home to prove there was a problem (even prior to opening a ticket for the first time), that the fibre provider is a joke! I don't think Vumatel or Frogfoot are bad... and I think some of them others are pretty good. But unfortunately they are not in my area and I sure as hell cannot afford to live in areas where they roll out.